What is the Social Wall? The Social Wall is an amazing way to keep your users engaged and allow them to communicate regularly with one another. This feature is like a chatroom. Your users can go there to create discussions, comment on existing ones, and even share images. 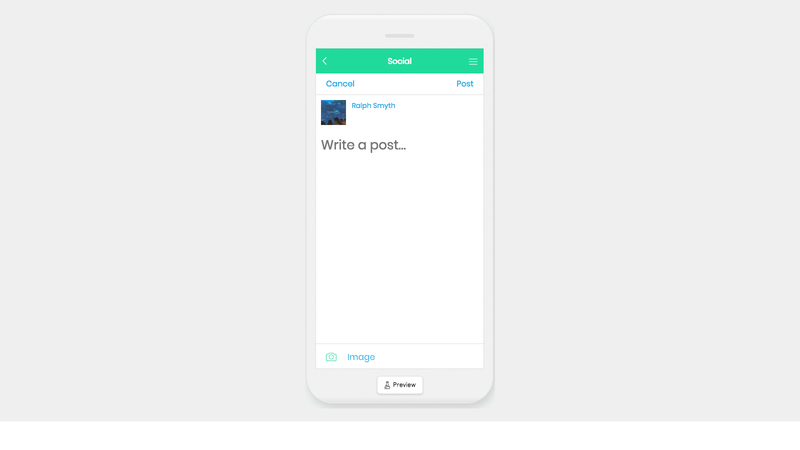 A user can choose to follow the social wall and they will receive push notifications when other users post to the wall they’re following or if other users comment on or like a post they’ve made. What are some use cases for the Social Wall? What are the Social Wall’s primary functions and what are the steps to accomplish them? 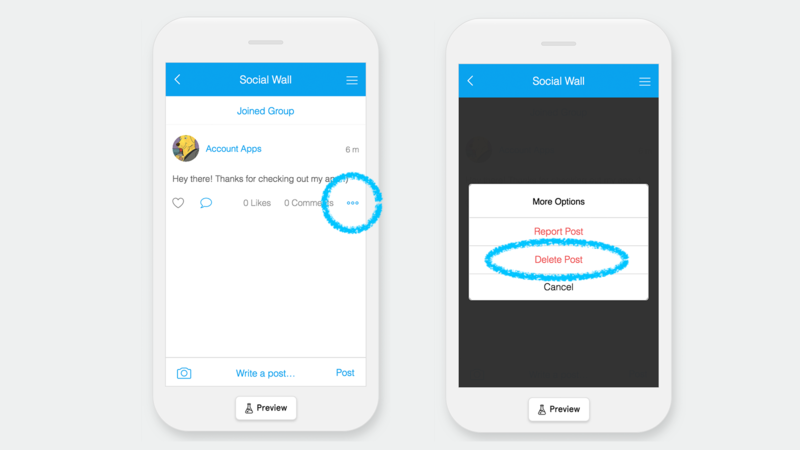 The Social Wall provides a great way to engage your app’s users as described in the introduction, but read on to see what some of the core features are and how to set them up. You can add multiple instances of the Social Wall if, for example, you’d like to have different groups about different topics or for specific demographics (i.e. Staff Only, Women’s Fashion, Baseball Fans, etc.). You can then add them to a Folder-type plugin for categorization. On this page, you can change the main image/icon and title. Now the Social Wall has been created and exists, but is not yet accessible to users. 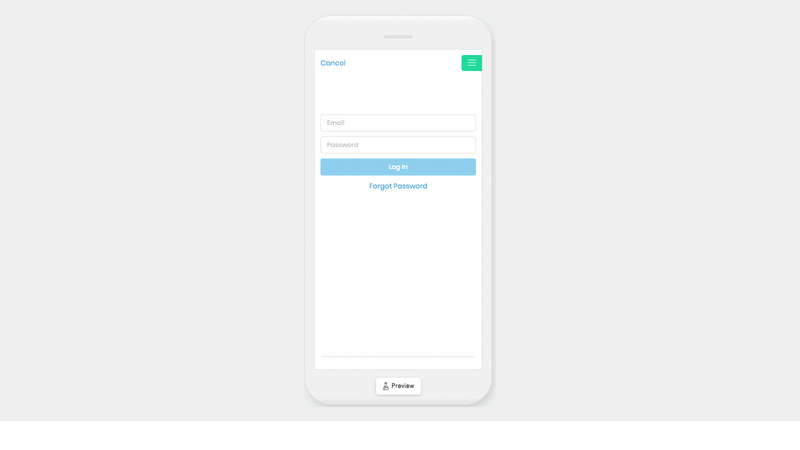 You will need to add it to the app on in a Folder-type plugin, to the Side Menu, and/or the Footer Menu. To add it to a Folder, navigate to a Folder and click on “Add Plugin Instance”. Want to learn more? Check out our Folder Tutorial here. To add it to the Side Menu, under Design in the left hand menu click Side Menu and then click on “Add Existing Feature”. Want to learn more? Check out how to add features to the Side Menu here. To add it to your Footer Menu, under Design in the left hand menu click Footer Menu. Then click “Add Action Item”. Then choose “App Content” as the action type and select your Social Wall. Want to learn more? Check out our Footer Menu Tutorial here. The Social wall uses our built in user profiles feature. This means that you will be prompted to login to the app to post on the social wall if you are not already signed in. You got this one. I believe in you! Click the post button to send your message out! If users have the app downloaded and are following the wall, they will receive a push notification letting them know about your super cool new post. Do Note: If you upload an image you will not see the progress bar for it uploading until you click the ‘Post’ button. As an App Admin, here's how you can delete them using either method. Step 2B: In the App, click the "More" icon and then "Delete Post"
Most of your users are awesome, but let's face it, there are some less-than-awesome people out there. If one of them happens to make it on your app, you have the option to ban them from your social wall. Note: Requiring a login to access the social wall means the user will have to create an account in order to even read posts on the Social Wall. You can also require that users have specific tag(s) applied to them in order to access it if you want to keep it private. If you would like to use multiple Social Walls for various topics or purposes, you can use Folders to categorize them into a master “Social Wall”, “Chat”, or “Discussion Topics” section. In order to post, like, or comment on anything in a social wall, you have to have an in-app account. This is great for you to learn about who’s on your app and what they like to talk about. You can also use this information later on when you target push notifications. 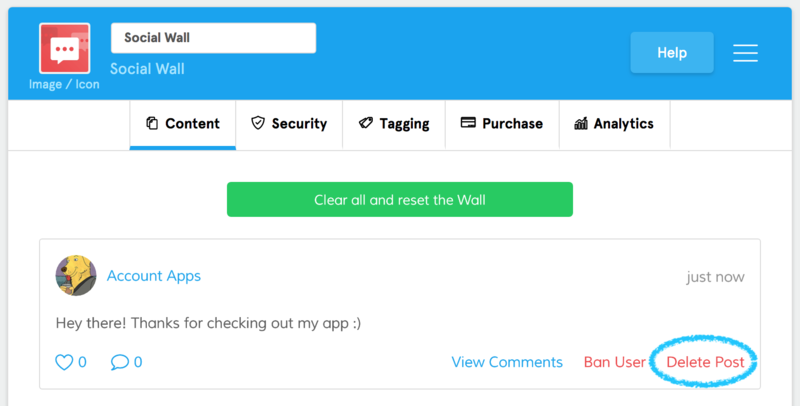 You can use the Social Wall with our Plugin access settings to allow only specific users to access and post on the wall. This can provide a segmented and private area for internal teams to communicate. To learn more about user tagging and security settings, check out our User Tagging and Management Tutorial.